How Advertising Agencies Should Find Clients - Peter Levitan & Co. The RSW/AgencySearch New Year Outlook Survey is out. It was completed by 150 senior level marketers in December 2013. I haven’t had a chance to review it in detail but I found the section on how clients find agencies (or conversely, how advertising agencies should find clients) particularly relevant to my current agency new business clients. The research shows that agencies need to directly target clients and make the “call” — a warm call. Agencies also need to have a referral strategy to stimulate referrals from current and past clients, friends and family. Yes, even cousin George. I have written about “warm calling” and how to grow referrals. Back to the study. 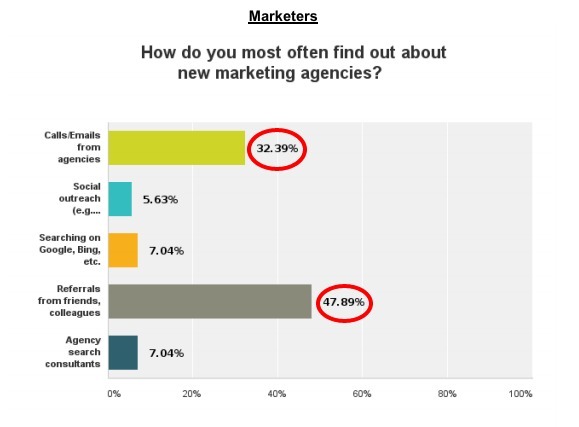 As you can see, 32% of marketers find out about agencies from direct contact and 48% use referrals. To not go directly to clients with the right message and not stimulate your referral base would be a huge mistake. You need sound strategies for both. This entry was posted in Marketing, New Business, Smart Agencies and tagged inbound marketing, marketing, new business, outbound marketing, social media. Bookmark the permalink. Trackbacks are closed, but you can post a comment.